Imec extends its CMORE service with a SiGe-MEMS foundry service and a multi-project wafer (MPW) service for universities and research centers via its EUROPRACTICE IC service. Both services are based on a monolithically integrated SiGe MEMS baseline process and come with an extended design kit. Via its CMORE initiative, imec offers companies all the services needed to turn innovative ideas into smart packaged microsystem products. The CMORE toolbox contains a wide variety of device technologies (e.g. high-voltage technologies, CMOS imagers, photonics or micro-electromechanical systems (MEMS)) and packaging capabilities (e.g. through-Si vias and MEMS capping) as well as design expertise and testing and reliability know-how. Imec’s services range from feasibility studies over design and technology development to prototyping and low-volume manufacturing. And through its alliance with TSMC, imec can also offer a path to transfer the technology to the foundry for volume production. The SiGe-MEMS platform is part of the CMORE offering. The technology is based on a MEMS-last approach, where the MEMS are processed after and on top of the CMOS circuits. It enables monolithic integration of CMOS and MEMS, integrating MEMS devices with the driving and readout electronics on the same die. This leads to a better performance compared to other integration schemes: there is a better signal-to-noise ratio through a reduced interconnect parasitic resistance and capacitance, a smaller die size and package, and lower power consumption. The imec CMORE SiGe-MEMS platform is versatile; its flexible and modular approach allows application specific tuning and optimization. An example is the thickness of the MEMS structural layer, which can vary between 300nm and 4µm. A 300nm-thick layer allows making optical MEMS, e.g. micromirrors. The process is then extended to add various coatings with specific reflective properties. A 4µm structural layer is used, for example, to create gyroscopes or actuators. Other possible applications of the technology are µ-microphones, µ-speakers, µ-sensors, µ-mirrors, probe-based memories and µ-power generation. 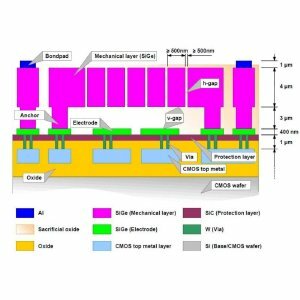 The extended CMORE offering and foundry service is based on this SiGe-MEMS platform, fixing the options in a baseline process with a 4µm SiGe mechanical layer on top of a CMOS layer. Supported by mature design kits for the most important commercial MEMS design tools, partners can develop their own MEMS designs for rapid prototyping using imec’s SiGe-MEMS technology. For universities and research centers, there is an MPW service. By gathering the designs of multiple customers on the same mask set, MPWs allow to fabricate test structures and prototypes of devices at low cost. A first MPW run, scheduled end of 2010, will be processed on a wafer with a single metal layer, and is meant for initial prototyping. A second run, with full capability and with the SiGe-MEMS devices on top of TSMC 0.18µm CMOS, is scheduled for mid 2011.